Ilú Obá De Min. Photo credit: Marcel Maia on flickr. Ever since I can remember I’ve been making music. Well at least that’s what my 3-year old self, banging on pots and pans or whatever I could gather, sounded like to me; though maybe not to the neighbors. Over time the banging developed into beats and pieces of music as I began playing the drums in earnest. Playing, writing, and making music provides an outlet for the everyday craziness of my schoolwork and the mountain of extracurricular activities (life). It is in music that I have found a spirit of undeniable and unparalleled freedom. A space to just be; to simply breathe. This truth is best captured in one of my fondest memories of my time in Brazil where I was able to attend a bloco in the streets of São Paulo. I can remember it as if it was yesterday. 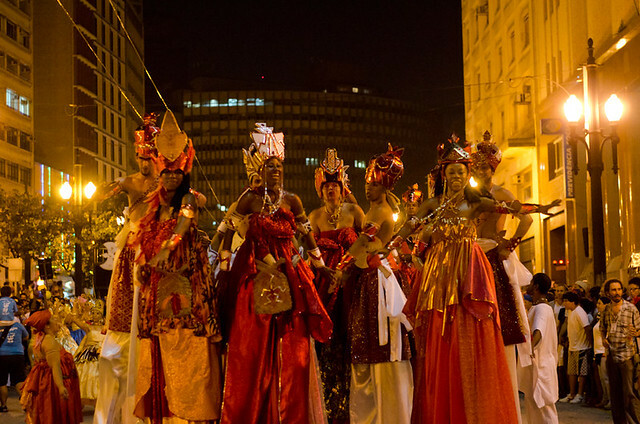 The drums pounded with an intense fervor producing an infectious rhythm that drove not only the dancers to move in one accord but also the crowd as it marched down the street Carlos Drummond de Andrade, to its final destination, São Paulo Cathedral. This amazing pulse of music was only surpassed by the beautiful harmony of the singers walking in the Ilú Obá De Min bloco and the collective voice of the crowd that livened the night. Being swept away in the passion of the music and moving in concurrence with the multitude of people represents the strong role that Samba plays within Brazil. I had the opportunity to experience firsthand the profound power that music has in building a collective experience and facilitating human connection. This moment serves as a reminder of the importance of preserving, maintaining, and keeping alive the cultural heritage that is tied to musical art forms and more importantly understanding its role in aiding progression and its potential for community building and empowerment. Though not in my own culture, I found freedom and felt at home and intimately connected to those surrounding me, through music. Where do YOU find freedom? Participate in this series by sharing your own post. See instructions here. Genuinely entertaining bless you, I believe your current visitors may want far more information such as this keep up the great content.